Plenty on Twenty II Hot is one of their most famous slot games redesigned! 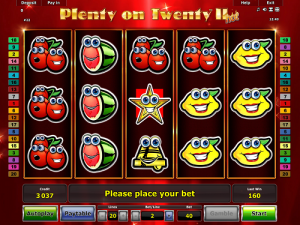 It’s a simple fruity slot game with, you guessed it, 20 paylines! Players might want to put this slot on mute as the symbols make a lot of noise when you spin the reels. They squeal in excitement as you spin the reels. That’s because they’re anthropomorphised! Every symbol on these reels has its own personality and a very big pair of googly eyes! People have been giving animals and inanimate objects human traits and characteristics for centuries! In fact, ever since the beginning of human history, we have been doing this! Archaeologists and historians have discovered and continue to discover ancient carvings, statues, art and literature which shows this. Many ancient Gods and Goddesses, for example, are anthropomorphised creatures! However, in this Novomatic slot game, the human-like symbols are all inanimate objects and they’re all very common slot symbols! Although Plenty on Twenty II Hot is a Novomatic slot game, it doesn’t necessarily look like one. That’s because this slot game was developed on Novomatic’s ‘Cool Fire II-S’ platform. The game is played with credits and you can choose how much each credit is worth, kind of like coins. Plenty on Twenty II Hot does not give our Free Games, unfortunately. You can play in autoplay mode and you can risk your wins! Unlike most other Novomatic slots, the gamble game in Plenty on Twenty II Hot doesn’t give you the option to ‘gamble’ or ‘collect’ but instead lets you ‘risk’ or ‘take’ your win! There are so many fruits and other famous casino symbols on these reels! Not every symbol has the same value. You can see how valuable symbols are by looking at the paytable. The cherries, the orange and the lemon are still smiling despite being the least valuable of all the symbols. The happy watermelon and the cheery plum pay out twice as much as these other fruits. Then there’s the grinning golden bell who doubles even their payouts. There are two more symbols on the reels. These are special symbols and they’re also much, much more valuable than the fruits and the bells. These are the red seven Wild and the golden star Scatter. The Wild symbol gives out wins of up to 100x your bet and the Scatter can pay a whopping 500x your bet! They’re both pretty special though. The Wild symbol can help complete wins by behaving as a substitute. Oh, how we used to love substitute teachers! Give the red seven the wrong name and he’ll never know! The Scatter is the only symbol on the reels, though, that doesn’t actually have to follow the rules. He’s the true rebel! All symbols (including the Scatter) need at least three matches to give a payout. All the symbols except the Scatter, however, have to follow the payout rules! 1. Only consecutive matches pay out a win (i.e. the symbols that match have to fall on reels that are next to each other). 2. The matching symbols have to land on a payline and follow its path. 3. The matching symbols have to fall from the left to the right, with the first of the matching symbols falling on the leftmost reel. The Scatter doesn’t have to listen to any of these rules, it can pay out from any position as long as there are enough of them on the reels (3 or more). This slot game is played in credits, which work like coins. You can set the value of a credit on the bottom left of the screen. Then, on the bottom right, you can adjust how many credits you wish to bet per spin. This will be taken from your balance, which will display your total amount of credits. This number will depend on how much money you paid in and what value you set your credits at. Then, you can open the paytable to view how many credits each symbol will pay you for spinning the corresponding number of matching symbols in winning positions! When you are awarded a win, you can choose to risk it or take it in Plenty on Twenty II Hot. When you take it, it will be added to your balance. When you risk it, you will have the chance to double it. A game will pop up where you have to choose the colour of the next card in the sequence. Will it be red or black? Choosing the correct colour will double your win but, be careful, choosing the wrong colour will cause you to lose it! Like other Novomatic slots, you can keep risking your win with the gamble game until you choose to take it or you make the wrong decision!